Artful Affirmations: It is time for Tea Cup Tuesday!!! It is that time of the week again! I want to thank each one of you for your good wishes from my last post. When I was able to get to the computer again, they really warmed my heart! You are all so dear and kind! So, what is more helpful than a lovely cup of tea? Chamomile is my all time favorite tea to drink. If goes perfectly with chocolate and so it suits me just fine. I find the best quality tea tastes far better than cheaper ones. 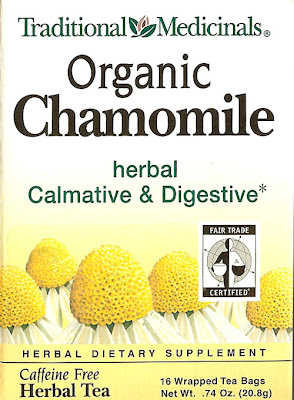 I have had Chamomile in restaurants that tastes like warm dishwater, and if that is the only way you have experienced it then try a really good quality like Traditional Medicinals. The cup I am showing today is new to me. My dear daughter gave it to me for my recent birthday. I was thrilled to open the box and see it! 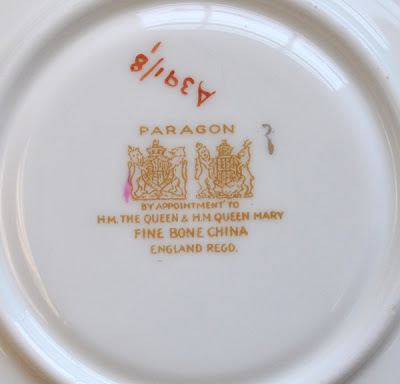 It is made by a company called Paragon, which was also made in Stoke-On-Trent in England just like my previous two cups. And, the original company was Star China Co. Unfortunately many of their pattern books were lost. Since they were not strict with their backstamps (often using old ones until they ran out), and since they also did not name many of their patterns (they made over 30,000) it is difficult to come to any solid conclusion about many of their cups today. If any of you out there know more about this I would love to hear it. So as far as I can tell, this cup and saucer could have been made anywhere from 1933-1952. I love the gold pattern over the pale mint color, and the rose is just beautiful! Such a pleasure to drink from! If you would like to join in with us and have others visit your blog and see your tea and tea cups, just enter your blog name in the first field below and your blog address in the second field, hit enter and you will automatically be put on the list by the magical Mr. Linky! That teacup and saucer are beautiful! I am planning on planting Chamomile this year in my tea herbs so, I can make some blends with it! Your cup is very beautiful...Paragon makes exquisite designs for their cupa and saucers. Ohhh Teri.. absolutely gorgeous! Can imagine you were delighted to receive it! I so hope you are feeling better soon.. hope it is nothing too severe with the neurosurgeon.. will be thinking of you.. Your tea cup is so beautiful!! I have never seen such a lovely design. I am partial to anything with gold leaf or gold on it. What a lovely gift to receive, her taste is magnificent! I do hope all goes well for you on your visit. My thoughts will be with you~ Try and rest. Terri What a beautiful cup and saucer, I have never seen a logo like that one on the bottom and I have seen a lot of them. Hope you are feeling better and can find out what is going on. I do hope that they find out what is making you feel this way soon! You will be in my prayers that you will be back to your old self soon! I really Love this Tea Cup! It is so pretty!! Thanks for hosting this great party. I really enjoy seeing all the lovely tea cups and hearing their stories!! I adore that teacup....it's just so lovely! I'm happy to hear you are feeling better and hope your dr appt goes well. Hugs! Your teacup is beautiful! Just gorgeous. Feel better - I am thinking of you, my friend. Gorgeous tea cup! I hope you are getting lost of rest and feeling much better, hopefully they will find out what the heck is going on next week. Teri. your teacups are magnificent. 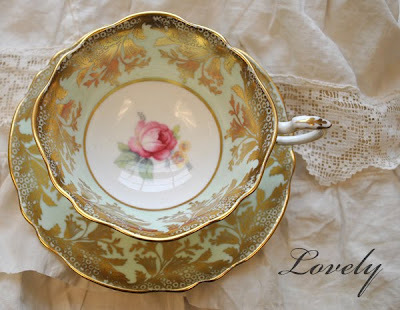 I'll be searching for teacups everywhere I go now so I'll have some prettier ones to post . Mine are so plain compared to yours but i'm working on it and inspired by your displays. marvelous tea cup and saucer - so elegant and refined! Well....great minds think alike! My teacup is from PARAGON, too! I love their line and wish I had more from the 1930's. Your cup is sweet...not only the pattern but that your daughter gave it to you for your birthday. Keep us posted on your doctor appt. I have been thinking about you all week! Wow..what a super gorgeous cup..I am enchanted! A very special gift..it is absolutely beautiful and stunning!! Lukcy girl! I hope you two ladies are feeling better soon! Your teacup is just lovely! I only drink organic teas myself and I enjoy them so much more than the others. Here's hoping you will be feeling much better tomorrow. Loved your little basket- it is amazing how everyone had such a different idea and take on the baskets! I know I had such fun making mine! I am glad I hopped over as I hadn't heard of your link party and will have to join in sometime soon! That is my favourite cup up to now; so very beautiful. Yes, I have to admit it....I am green with envy. I hope you are feeling better Terri...sending you good wishes and hugs. Your cup and saucer are indeed beautiful! As beautiful as the owner! My thoughts and prayers are with you in hopes of sunny days and speedy recovery! Be well and be blessed. just wanted to let you know that I'm thinking of you and hope that you're feeling fine now. i can give you all kinds of examples of really cool paragon. let me know if you want to see them and i will do a post about them! What a beautiful tea cup and happy you found it in Canada. I loved reading the history and was very happy to see you posted today. The teacup and the austrian one above are just beautiful.MY half century is in may and i am in foir a change,Thanks for you kind comments on my blog.I am looking forward to next tuesday.